What a difference professional cleaning and restoration makes! This marble shower in a San Diego home had etch damage from improper cleaning solutions. When acidic substances come into contact with calcium in natural stone, the appearance and texture of the surface of the stone changes. The homeowners had no idea that cleaning can never remove etches, because etches must be honed away. When they called us about the problem, we explained that etch removal most often requires professional restoration. We utilized the proper tools, knowledge, and experience to tackle the etch problem in this marble shower. First, we honed the stone to remove a very thin upper layer, virtually erasing damage and revealing the smooth, clean stone underneath. Then, we polished the marble to restore it to a beautiful, factory finish. Our final step was to apply a penetrating sealer to inhibit staining. The homeowners were thrilled at how clean and new their shower looked with all the etch damage removed. Does your marble or other natural stone shower look stained or etched? 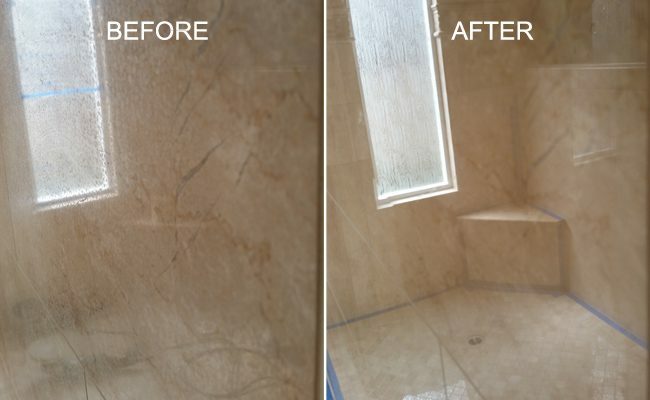 We provide natural stone shower restoration, honing, polishing, and sealing services throughout the San Diego area. Contact us online or call 619-246-0240 today for a FREE estimate.